The Bonnies rolled into Tom Gola arena Wednesday night looking to win their seventh straight, and to keep the momentum going before their big tilt on Friday night against AP #16 Rhode Island. The Bonnies controlled most of the game, coming away with an eleven-point victory. Jay Adams is shooting 50.8% from deep. Yes, you read that right, 50.8%. That puts him at 6th best in the nation, even though he averages more threes per game than all of the people ahead of him. It’s been a truly remarkable improvement from his pedestrian 35% last season. At this point, the Bonnies best play is to let Adams fire away no matter where he is on the court. Are the Turnovers an Issue? While Adams has been nothing short of spectacular lately, the one problem in his game may be the turnovers. In the past two games, he’s turned the ball over 12 times, while only gathering 12 assists. Don’t get me wrong, Jay’s value would still be highly positive even if he turned the ball over 20 times in those two games, but looking forward to Friday, the Bonnies cannot afford to give possessions away to a powerhouse like Rhody from careless passes and dribbling. Mobley’s season has been filled with inconsistency. One half he’ll be lighting up the scoreboard, and the next he won’t shoot. But tonight, Matt Mobley had one of his best games yet, totaling 30 points and 9 rebounds. Most importantly, every time the Explorers made a run and threatened the Bonnies’ lead, it seemed that Matt would hit a shot to keep them at bay. Izaiah played more minutes against La Salle than he’s played since the Bonnies last trip to Philly against Saint Joseph’s. This probably isn’t a coincidence though, since Schmidt saw how well he played in front of his family and friends the first time. He didn’t have his best game, though he still managed to get 5 points and get to the line twice. The Bonnies fouled 18 times Wednesday night. That is simply too many fouls to commit against an inferior team. The Bonnies got away with the fouls because La Salle had enormous trouble driving the lane and getting easy buckets at the rim. Rhody won’t be the same story though. The fouls that hurt the most are the ridiculous pokes at the ball on the offensive end after the other team has just grabbed the rebound. Can’t have that against URI. It doesn’t matter how good the Bonnies are, or how bad La Salle is, Tom Gola arena has been a tough place to win for SBU. Before last night, they hadn’t won since 2010. Adding on to the worry for Bonnies fans was that La Salle was 8-2 at home heading into this game. Many feared a repeat of the debacle in Philly in 2016 when the team needed to win to prevent a bad loss on their NCAA resume. History wouldn’t repeat itself though, and the Bonnies finally got out of there with a win. The Bonnies seem to sense the importance of every game now. 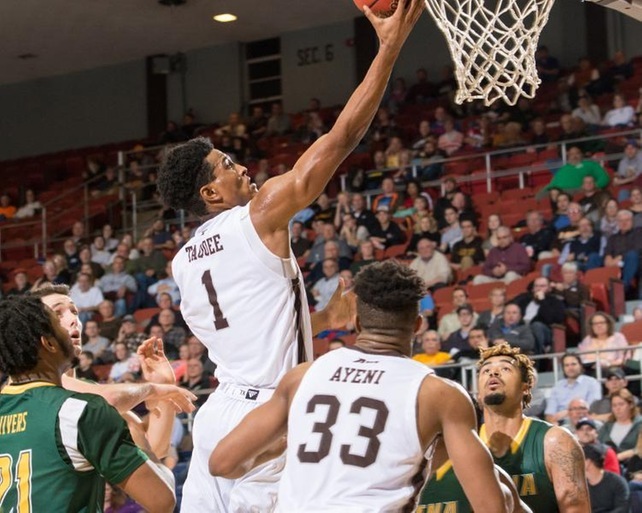 Back during the 4 out of 5 game losing streak, I questioned whether the Bonnies had a sense of urgency, or whether they were relying on their innate talent to carry them through tough games. In these past seven wins though, the Bonnies have had full energy from the tip to the final whistle. They understand that the deck is stacked against them, and the enormous hurdles they have to clear to make the NCAA tournament, but lately, they’ve been attacking those hurdles head on. Joel Revo is a Sophomore at the University of Michigan Ross School of Business. Joel grew up in Vermont, where with his dad, he traveled to many Bona games in almost every A-10 venue. He has been to every A-10 tournament game since 2012, and will continue the tradition this year in Brooklyn. As of today Joe Lunardi has Canisius, Vermont, and Buffalo, all in the NCAA Tournament, all three teams we beat. Bonaventure also took down a fully healthy Maryland team on a Neutral court and took down ‘Cuse up at their Dome. Those are 5 very good wins for SBU, wins the Committee (if their doing their jobs correctly) have to see and realize when fielding the 68 team field. After Providences latest win it now looks like Rhody has 4 teams they beat (at most) in the Tourney, so their shouldn’t be as big as a gap between Bona’s and Rhody, both schools should be on the inside looking out! Regardless tho let’s say Bonaventure beats Rhode Island this Friday, if the Committee doesn’t have SBU and URI both in the field of 68 “safely” then it just means a school like Bonaventure will never ever get a fair shake, and that the NCAA Committee never intended to have more than 1 school from the A10 “dancing”! It will also finally prove the NCAA is all about the money and that small school Cinderella’s are a thing of the past, cause from here on out the Tournament will just be about P5 Schools and the Auto-bids from 1 Bid Conferences! !..